Publisher: Daw Books, Peguin, New York, New York, U.S.A. 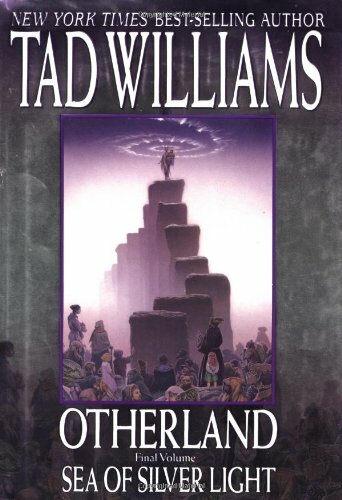 Here, at last, is Book IV in Tad Williams' acclaimed Otherland series-the book his fans have been eagerly awaiting. A brilliant blend of science fiction, fantasy, and technothriller, it is a rich, multilayered epic of future possibilities-in which virtual realities offer new pathways to immortality...for a dangerous price. With Sea of Silver Light, Tad Williams completes his massive Otherland quartet, one of SF's more intriguing explorations of the eroding boundaries of the human and the nonhuman, the living and the dead. Otherland is a sequence that contains many secrets, and Williams plays fair by unpacking all of them in the final book. A group of adventurers searching for a cure for comatose children find themselves trapped in a sequence of virtual worlds, the only opponents of a conspiracy of the rich to live forever in a dream. Now, they are forced to make an uneasy alliance with their only surviving former enemy against his treacherous sidekick Johnny Wulgaru, a serial killer with a chance to play God forever.